I’m so excited to share this with you!!!!! I know that’s a lot of exclamation points, but I simply can’t hold back how happy I am to finally tell you about this new project that I’ve been working on for over a year. 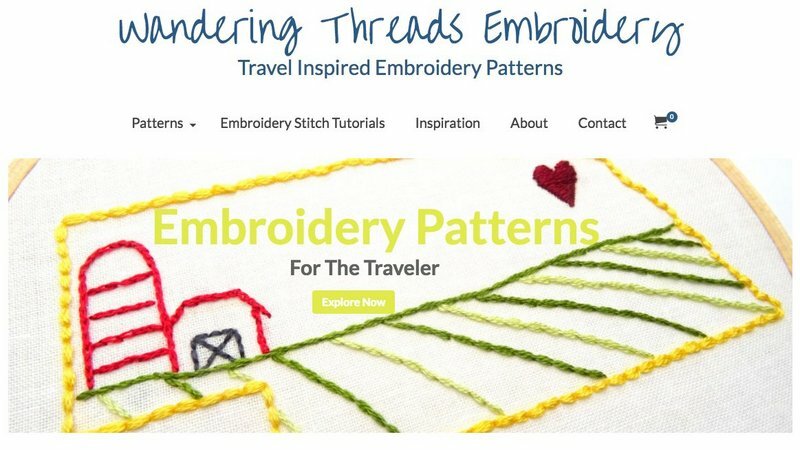 It’s called Wandering Threads Embroidery and it combines my love of embroidery, travel, and nature into one awesome website featuring downloadable patterns and simple embroidery stitch tutorials. It all started four years ago when I taught myself to embroider using Youtube videos and online tutorials. I was hooked pretty much from the first stitch. At the time we were boondocking in the California desert and I was in search of an RV friendly hobby. You know…something that didn’t take up much space and could be done from the couch, hammock, camp chair, or even the beach. Embroidery fit the bill perfectly. I started with a single hoop, 1 needle, a piece of scrap fabric and some embroidery floss that I found tucked in the back corner of the tiny hobby store in town. After practicing my stitching with a rudimentary sampler made up of random lines and shapes, I moved right into designing my own patterns. Starting with an Airstream of course! Eventually, I created a series of Airstream-themed designs with different backgrounds and quotes. For a brief minute, I thought I could sell them on Etsy. Have you ever tried to sell something on Etsy? Let me tell you, it’s not easy. The site is so saturated with items that simply getting your product to show up in a search result is nearly impossible. It was only after I shared the designs here that I sold a number of custom Airstream pieces (because you guys are awesome). After spending a month frantically embroidering custom designs while fretting about getting the stitches perfect and lettering straight made me realize that selling handmade items is not for the faint of heart. It’s also not very financially savvy (spending 6 hours creating something that I can only sell for $25 doesn’t make much sense). Next, I had the brilliant idea to sell embroidery kits. I made up packages that included everything to create a beautiful embroidery piece. I started by offering my US Travel Map design and sold quite a few. Some of you might even have one hanging in your RV right now. I sold them for about a year before realizing that storing all the supplies for the kits and constantly having to mail out packages didn’t really fit into my lifestyle. In the meantime, I had started playing around with individual designs for each state. At first, I simply wanted a small piece of art to display when traveling around a state. 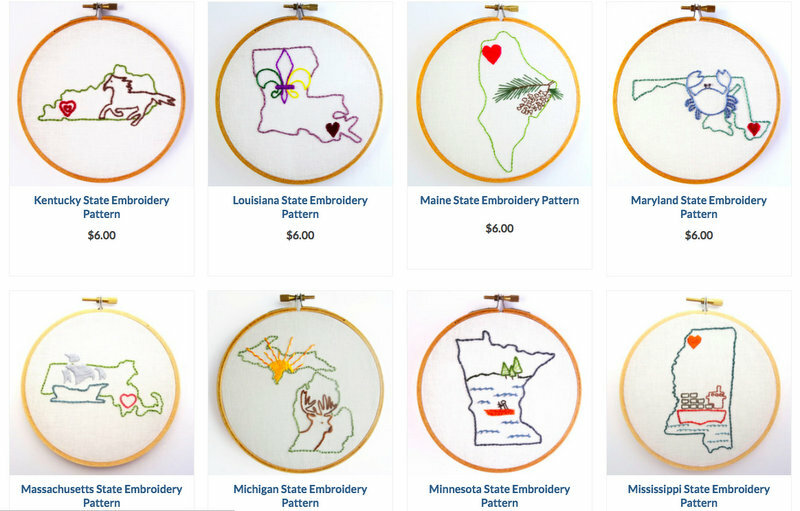 As my collection of state embroidery designs grew, I found myself thinking more and more about how I could share them with others. 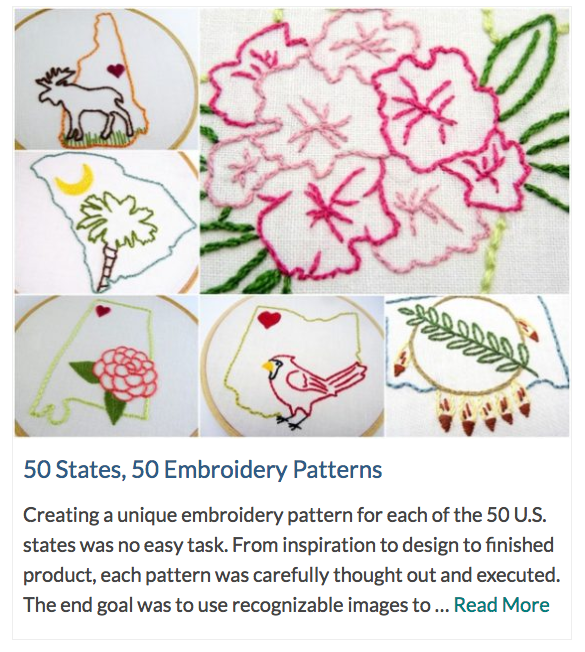 One day while searching around on Pinterest for design ideas I came across a site selling embroidery patterns as digital downloads. That’s it! I can make each design into a PDF and sell downloadable copies. No more finding a place to store supplies or go to the post office! Now, I just needed a place to display all these designs and a way to sell them. That’s when the Wandering Threads Embroidery site was born! A small sample of the 50 state designs I have created. One for each state! I’m very proud to announce that I have now created a design for all of the 50 states and three national parks. More national park patterns are in the works — I’m nearly ready to release the design for Rocky Mountain NP — and I hope to eventually offer them all. A full-color photo of the finished embroidery piece. A reverse image of the pattern to be used for iron-on transfer methods. 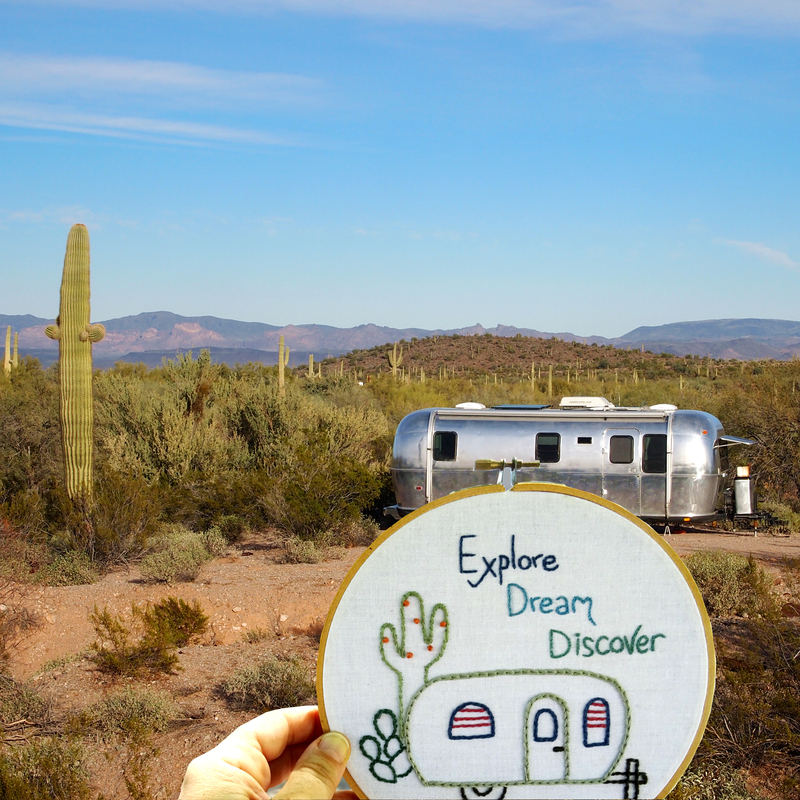 My dream for Wandering Threads Embroidery is not only to sell patterns but to develop a community where travel, nature, and embroidery come together to create amazing works of art. 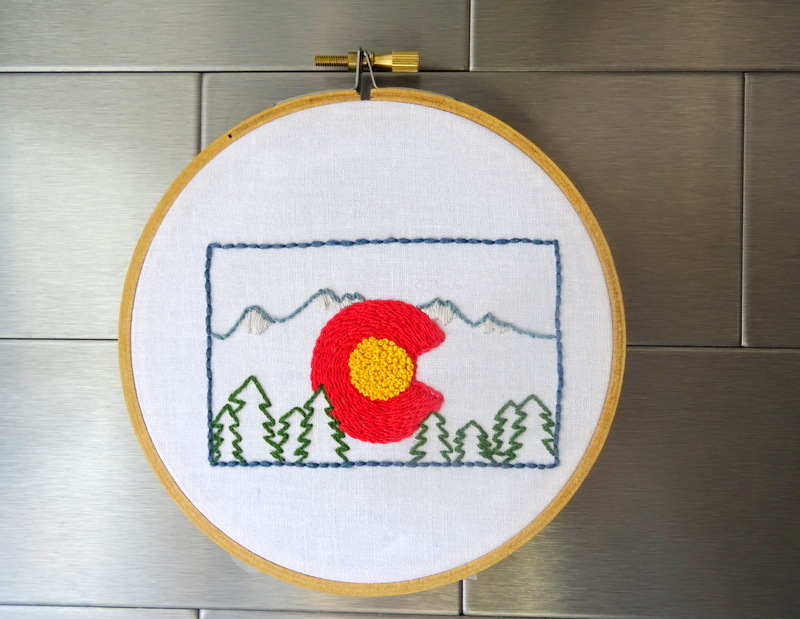 Embroidery is a fun, relaxing and simple art form that I truly believe anyone can master. 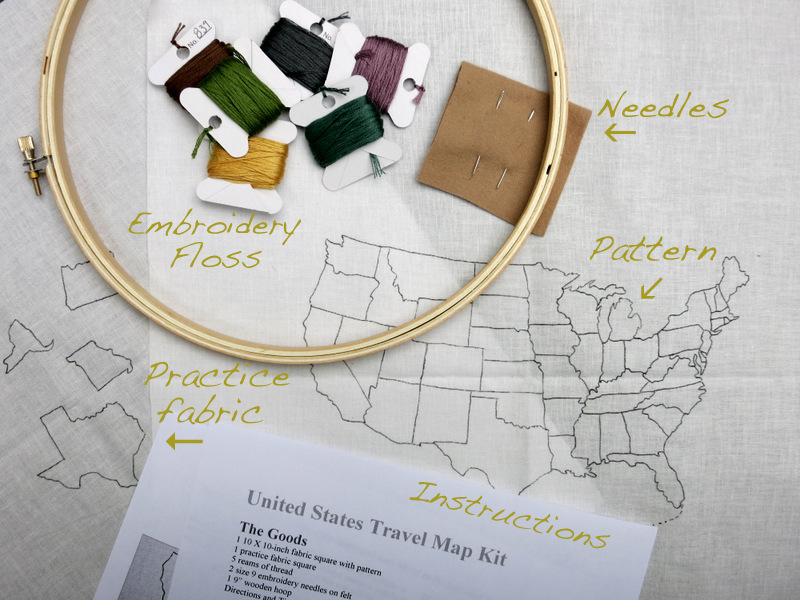 For that reason, the site also contains a selection of Stitch Tutorials perfect for beginners or those wanting to brush up on their stitching skills. So far, I have five step-by-step stitch tutorials with more on the way. If you want to stay up to date on all the new developments be sure to follow my Wandering Threads Facebook page or Instagram account. I will also be sending out a Weekly Newsletter featuring sneak peeks of new patterns, announcements about new tutorials, specials deals, and a first look at my Inspiration Blog Posts with behind-scenes glimpses into the design process. Right now, I’m offering a 10% off coupon good for your first purchase if you Sign Up to receive the Newsletter. 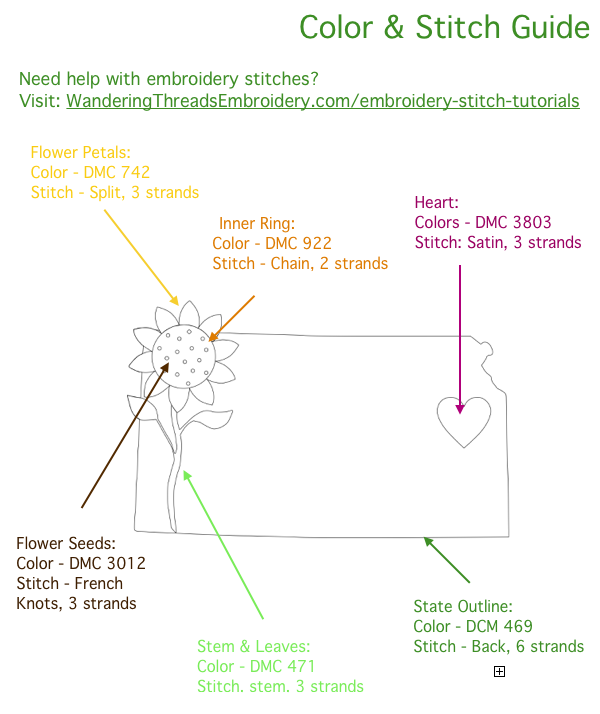 I’m sharing the news about the site here because I created Wandering Threads Embroidery with all of you in mind. While the designs are suitable for anyone, they are an especially good fit for travelers, dreamers, and nature lovers. I have a multitude of ideas floating around in my head for new designs that my fellow travelers might like. In addition to more national park patterns, I want to create a Canada travel map, a series of city skylines, designs featuring state flowers, and so much more. Check out the site and let me know what you think. If you have ideas for new patterns, comments on existing patterns, or just want to chat about embroidery, I want to hear from you! You can leave a comment here, or contact me directly through the Wandering Threads site. Happy Stitching! Congratulations on your new business venture. Love the idea and your designs! Good for you. Much success for your new endeavors. I’m still working on my USA I purchased from you when you 1st offered. Instead of states visited, I’m filing the whole map in. Over my lifetime been to all but 47 states and having fun with it. I still carry my mom’s and grandmother’s pieces they did. I hope you rock this..creativity cleans the soul. I saw their doing jewelry now too. Thanks Amanda! So happy to hear that you’re still working on your map! I would love to see a picture when it’s done! Be sure you copyright your designs in case some larger company tries to steal them. It’s not hard to register. Good idea. I’ll look into it for sure. This is wonderful Amanda! I wish you continued success and inspiration! Your designs are beautiful. As an ex-seamstress I really appreciate handmade items and the effort that goes into them. Good luck in your venture. I will be signing up for that newsletter. 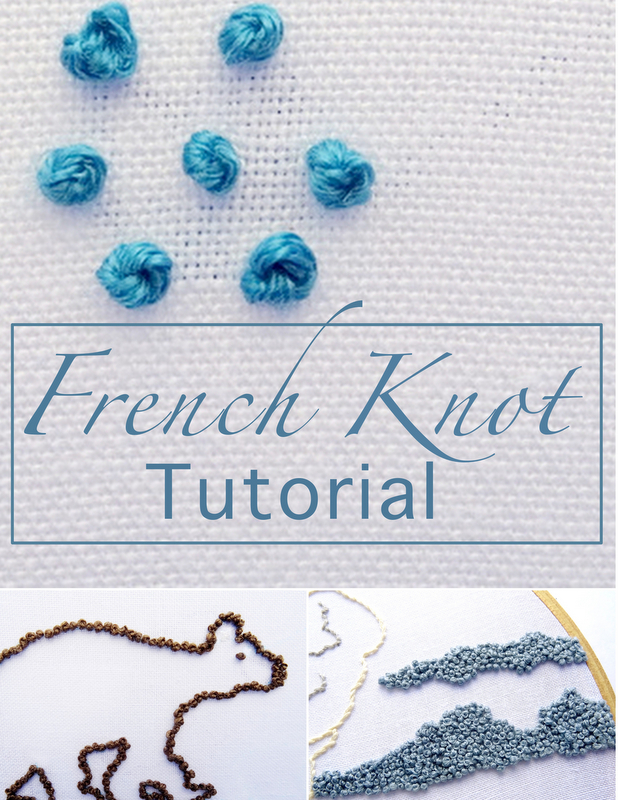 I need the tutorial on French knots. Thanks Gwen! After I got the technique down French Knots became one of my favorite stitches.